A NEW MAGAZINE is born! It conies to fill a most serious need — in your life! You live in a world of frustration and despair, whose greatest problem is the very question of SURVIVAL! And now our new magazine, TOMORROW'S WORLD comes to bring hope, assurance and TRUTH. Our commission is to proclaim to the whole world the GOOD NEWS of the coming WORLD of PEACE. World leaders, however, will not produce it. The search for peace seems to be the number one occupation of governments today. Yet none knows where to find it. None knows THE WAY to peace! It is like the elderly lady who searched every nook and cranny of her home to find where she had mislaid her glasses. They were nowhere to be found — until she went to wash her face. Then she discovered they had simply been pushed up above her forehead. They were right there all the time — she had simply not known where to look. But if we were to tell the world about the ONLY PLACE where the way to peace can be found, the world would not listen, for that is a Source the world has rejected. It refuses to look there for THE WAY, or to listen if it is read. It simply does not speak their language. Consequently, we get this GOOD NEWS to the world in the world's language. The PLAIN TRUTH magazine makes that Truth PLAIN — in a language this world understands, and will accept. But now comes TOMORROW'S WORLD, for those who accept the one Source where this Truth may be found — those who wish to go deeper into this precious gold mine of Truth, IN ITS OWN LANGUAGE! We have been given, one might say, a dual commission: 1) Our first and principal commission is to proclaim to the whole world, AS A WITNESS, the good news of coming world peace. In Bible language, it is called "Christ's Gospel" (the word gospel means good news) — and that Gospel is the Kingdom of God. The Kingdom of God is the coming WORLD GOVERNMENT that will bring peace. World leaders — both statesmen and scientists — are saying the world's only hope is WORLD GOVERNMENT. So we proclaim it in their language — not Bible language. We are commissioned to proclaim it ONLY as a witness. Following Christ's example — and Peter's and Paul's — we make no effort to "cram Christ's religion down their throats." Jesus said none can come to Him (spiritually — religiously) except the Spirit of God draws him. We are humans. We cannot "draw them." That is not our job — it is GOD'S Jesus never pleaded, "WON'T you accept me?" He never urged or begged any to "be saved." Nor did Peter nor Paul. That is a modern Protestant RELIGIOUS invention and practice. Our commission TO THE WORLD is to preach the GOOD NEWS as a witness. This we do IN THEIR LANGUAGE. This we do as an interesting, dynamic EDUCATIONAL broadcast — NOT as a religious program. For this, The PLAINT RUTH is our vehicle-in-print, besides free booklets. But our second commission is to "FEED CHRIST'S SHEEP," to put it in Biblical language. Those whom God, through His Spirit, has drawn to Christ — HAS converted — need deeper spiritual food. 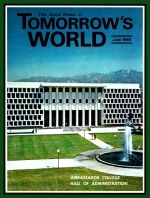 And now TOMORROW'S WORLD becomes our magazine to help in that phase of our commission. World leaders search for the way to PEACE. Yet they see nothing ahead but ever-worsening troubles with no solutions. The reason they see no solutions is that they willfully hide their eyes from the CAUSES. For every wrong result there has to be a CAUSE. To CAUSE the desired results of peace, happiness, prosperity, and abundant well-being, our Creator set in motion invisible and inexorable laws. There is no other way And to obtain these desired ends. Yet a rebellious mankind refuses obedience to THAT WAY. It seeks those results by going the opposite way. And that is THE WAY that produces every unwanted trouble! There is one root CAUSE for all the troubles this world is suffering — transgression of our Maker's right WAY OF LIFE — that WAY expressed in principle by the Ten Commandments. This world, in general, has lost contact with, and therefore knowledge of its Maker — the SOURCE of everything good that man desires. The living God our Creator RULES over His entire vast, limitless creation. But to fulfill His purpose, He has marked out a duration of 6,000 years to allow man to make his own free choice. Humans have been made free moral agents — creatures of CHOICE. Then there is to follow that 6,000 years the direct supernatural intervention of the Great Ruler of the Universe. He will enforce the rule of His Government for 1,000 years. Even the nature that has drawn humanity like a magnet toward false values and into the wrong ways will be changed! TOMORROW'S WORLD will, therefore, be a world of PEACE, PROSPERITY, HAPPINESS, ABUNDANT WELL-BEING! Our commission is to proclaim to the R hole world this GOOD NEWS of the Kingdom of God and of His gift of eternal life; and to prepare the way for the coming of the glorified Messiah. Very soon, now, He will come to this earth in supernatural POWER and GLORY! He is corning to RULE all nations — to set up WORLD GOVERNMENT! World statesmen and scientists say WORLD GOVERNMENT is the only hope of world peace. But men could never achieve it. Christ is coming to rule with TOTAL supernatural power and force! He is coming, strange as it may sound, to force peace, happiness and abundant well-being on a human race that will not accept, voluntarily, the WAY that will cause it! Our commission is to get the GOOD NEWS to the world. But we cannot gain the attention of the world by using religious or Bible-sounding language. We have to be realistic. The world in general, by nature, is hostile to God's Message — when spoken in religious-sounding language. God explained that through the apostle Paul. He wrote: "The carnal mind is enmity (hostile) against God: for it is not subject to the law of God, neither indeed can be" (Romans 8:7). If we go to the world with BIBLE LANGUAGE, the world will not listen! On the other hand, we know that the very foundation of ALL knowledge — the very basis of all right EDUCATION — is God's revealed Word — the Holy Bible! But the world does not know that. Nor will the world, IF it knows it is coming from the Bible, accept it. Actually — think of it — the Bible is the BASIS of right EDUCATION. But the world will not look into the Bible for it. Nor, if you speak in BIBLE LANGUAGE, will it hear or accept it! To reach the consciousness of the world, therefore, we have to SAY IT IN THE WORLD'S LANGUAGE! Now what IS salvation? It is THE PURPOSE for which we were put here on this earth. So, to the world, we don't use the word "salvation." We talk about the fact that one of the very BASICS of knowledge is an awareness of the meaning and the PURPOSE of life — to make life MEANINGFUL. The world will listen to that kind of language. To gain the attention of the world — to get God's Truth — Christ's Gospel — into the consciousness of the millions in the world — WE HAVE TO SPEAK THE WORLD'S LANGUAGE! Not the spiritual-sounding language of the Bible. So, in The PLAIN TRUTH, and other literature, we do this, even as the apostle Paul did. He set us an example. We speak to unconverted, non-religious people, in non-religious language. Paul said: "I am made all things to all men, that I might by all means save some." He explained: "Unto the Jews I became as a Jew, that I might gain the Jews." He spoke their language! "To them that are under the law, as under the law, that I might gain them that are under the law. To them that are without law, as without law.... To the weak became I as weak, that I might gain the weak.... And this I do for the Gospel's sake...." (I Cor. 9:20-23). Did you ever stop to think WHY we named the parent magazine "The PLAIN TRUTH" I Jesus said, "THY WORD is Truth." God's Word — the BIBLE — is TRUTH. The PLAIN TRUTH magazine makes Bible truth PLAIN! But HOW can you do that to a world prejudiced against the Bible — a world whose carnal minds are HOSTILE against GOD — whose minds are prejudiced against reading what they recognize as coming from the Bible? Do you realize that modern education as a whole — especially high school and university-level education — has literally rejected the Bible? They have adopted the theory of EVOLUTION. That theory becomes their CONCEPT — their APPROACH to all knowledge. For example, take the textbooks on history. You find NOTHING in them about the historic creation of Adam and Eve, or the presence of Satan in the garden of Eden. You find NOTHING about any man named Noah and a universal earth-filling deluge. You find NOTHING in accepted history textbooks about Israelites in Egypt, or Pharaoh's armies being drowned in the Red Sea. The modern historic approach is: that if an event is recorded in the Bible it never happened; for modern scholarship discredits the Bible as a source of historic TRUTH. "When they knew God, they glorified Him not as God, neither were thankful; but became vain in their imaginations [reasonings], and their foolish heart was darkened. Professing themselves to be wise [intellectual scholarly, highly educated], THEY BECAME FOOLS… And even as they did not like to retain God in their knowledge, God gave them over to a reprobate mind, to do those things which are not convenient [proper]" (Rom. 1:21-22, 28). Notice, they did not retain GOD in their knowledge! In the knowledge they disseminate, GOD IS NOT IN IT — nor God's revelation of Truth — the BIBLE. They are hostile against it. So, how do we get Christ's Gospel Message past that barrier of prejudice, and INTO THEIR CONSCIOUSNESS? If we ran an article in The PLAIN TRUTH headlined: "REPENT, and TURN FROM YOUR SINS, FOR CHRIST IS COMING SOON," how many of this world's educated do you suppose would read it? Do you see what I mean? We DO say it in The PLAIN TRUTH — but not in those words! We speak to the world in the world's language! We are now pitting large-space ads in mass-circulation magazines around the world. We offer readers of these magazines an already-paid subscription to The PLAIN TRUTH. These ads are placed before a worldwide readership of about 150 million people. So HOW do we get Christ's message into their consciousness? We speak THEIR language. When our headline says: "Why, MARRIAGES BREAK UP" with such drop-heads as: "This article brings you the true perspective of the modern Western marriage crisis — the incredible statistics about divorce and marital unhappiness — and gives you the practical LAWS that make marriage work" then hundreds of thousands — even millions — do read it, We caught their attention — we pricked their interest – we created suspense in their minds to want to know the answer. In the article, like any article in LIFE or LOOK magazines, or in the London Sunday Times, we give them the facts — the statistics — state the problem. But WHERE do you suppose we get the ANSWERS? WHERE do we find the LAWS that work? Why, in God's Bible, of course. But we don't necessarily need to quote the Bible. That's not their, language! So we tell them THE TRUTH — we make the Truth PLAIN — in THEIR language, because it would not be plain to them in a religious language they do not understand! We put it in the language of EDUCATION, not the language of RELIGION. And FIVE MILLION ARE NOW READING The PLAIN TRUTH! Now, naturally, speaking to this whole WORLD, in a manner that can make the Truth PLAIN to them, in their language, we cannot say, "now take up your Bibles, and turn to thus and such chapters and verses, and we will expound them and make them PLAIN." 1) That would not make it PLAIN to them, because they don't speak that language, and 2) due to prejudice, they would refuse to read it, anyway. We would fail to get the Truth through to their consciousness. YOU MUST REALIZE THERE ARE TWO KINDS OF MINDS — 1) the carnal, or natural, physical mind with which all have been born; and 2) the spiritual mind that has been opened by God's Holy Spirit, and now has SPIRITUAL COMPREHENSION. The natural carnal mind may have GREAT comprehension of material knowledge. The brain of a cow or a chicken is something pretty stupid by comparison. But, spiritually speaking, the GREAT MINDS of GREAT men or women, still carnal are just as spiritually, stupid and unable to understand, as the cow or chicken brain is MATERIALLY unable to comprehend. OUR NUMBER ONE COMMISSION is to REACH THE WORLD — as a Witness! The PLAIN TRUTH is our magazine for them. Our second commission is to feed spiritually Christ's "sheep." The new magazine, TOMORROW'S WORLD, is for those who are God's people — who want, and are ABLE, to go into the deeper spiritual truths — those to whom we can say, "Open your Bibles, and we will expound and MAKE THE TRUTH PLAIN!" Our number one commission is to proclaim Christ's GOOD NEWS as a witness — not to try to force conversion on any. Only God can convert. None can come to Christ as Saviour, anyway, until and unless God the Father draws them. God GRANTS repentance (John 6 :44; Acts 5:31; 11:18). Once we gain the INTEREST of readers, make plain the FACTS — give them the KNOWLEDGE — it may lead to their salvation, if and when God GRANTS repentance and DRAWS them by His Holy Spirit. But first, we must reach through, past their prejudices, and plant the right KNOWLEDGE in their consciousness. That requires an EDUCATIONAL, no t a religious program. And, let me repeat, our major commission is to get the Good News to them AS A WITNESS. Of course there is the second phase of our commission — to FEED CHRIST'S SHEEP. The PLAIN TRUTH is our instrument for the former — TOMORROW'S WORLD for the latter. THIS, then, is the magazine to FEED CHRIST'S SHEEP. To FEED those spiritually hungry for the deeper SPIRITUAL FOOD. We plan to make TOMORROW'S WORLD available — subscription already paid — to any and all who hunger and thirst for GOD'S TRUTH, and who can receive and digest the stronger spiritual food.